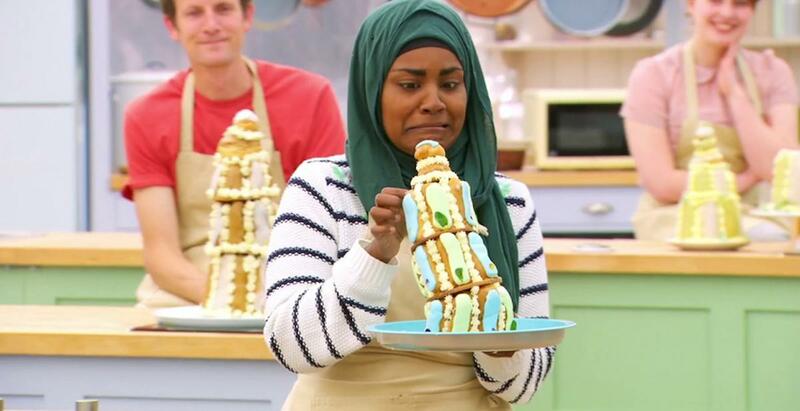 The Great British Baking Show (or The Great British Bake-Off if you're in the U.K.) is one of the most innocently dramatic reality competition shows on TV. Nowhere else can you see people have complete emotional breakdowns over cracked fondant tennis courts, fallen eclair towers, or melted chocolate mousse cakes. Honestly, it makes me feel a lot better about my own #cakefails. In the words of former host Sue Perkins, "It's just a cake!" Below, a few creations that went horribly and hilariously bad. 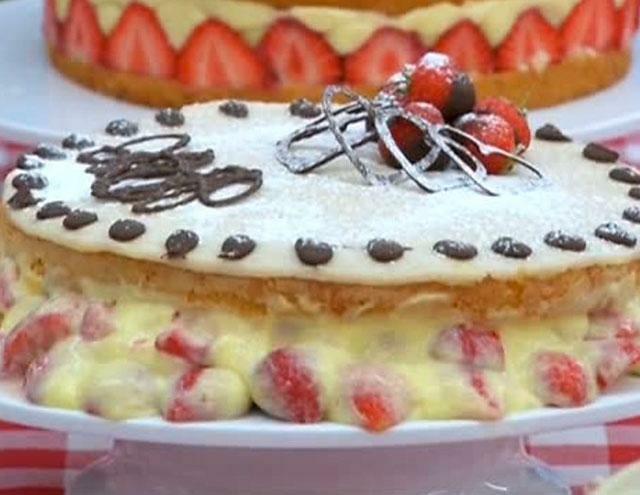 During The Great British Baking Show's first-ever Vegan Week, contestants had a hard time dealing with various dairy substitutes in place of milk and eggs. However, no one struggled as much as Ruby Bhogul, who made an ambitious topsy-turvy two-tiered cake. As the clock ticked down, it was obvious the cake wasn't going to stay upright, resulting in her having to seek help from two other contestants to hold the cake in place. However, after time's up was called, all the bakers let go of the cake and left the tent hoping the cake would stay upright out of sheer willpower. Spoiler alert: It didn't. The top-tier of the cake slipped down as the other contestants watched on in horror from outside the tent. 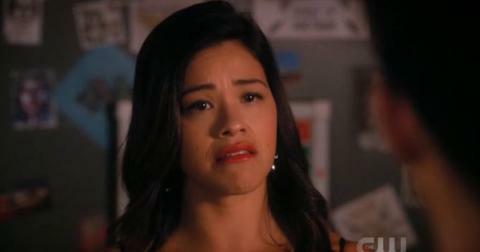 Ruby broke down in tears. Fortunately, the cake tasted well enough that she didn't get sent home, but still, it was definitely one of the most dramatic moments in the show's history. But Ruby wasn't the first cake dropper (and certainly not the last). James Morton was all set to win season 3 (for Netflix watchers, he appears in the first season of Great British Baking Show: The Beginnings) until he dropped one of his cakes all over the floor. He was still able to rush and make four more cakes before the the time was up, but the cakes were unimpressive, sloppy, and failed to impress the judges. Womp, womp. There has actually been two times contestants mistakenly used salt instead of sugar in their cakes (with one of them even going so far as to win their season), but none were as disastrous as Toby Waterworth's. You probably don't even remember him cause he was the first person sent home during season 4 (collection 2 for you Netflix watchers). His salty angel food cake was so disgusting, judge Paul Hollywood spat it out and dramatically told judge Mary Berry not to eat it. 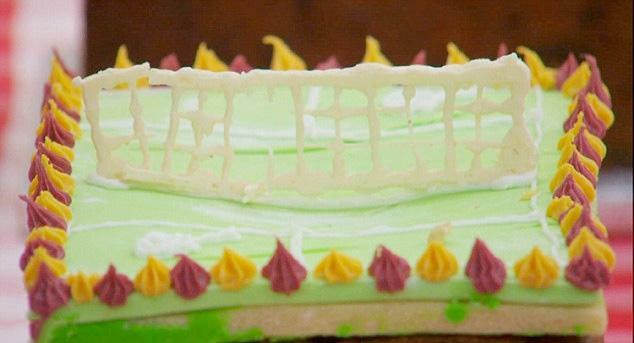 It didn't help that in the next challenge, Toby screwed up his showstopper cake by making it too dry. Now this was just sad. When Dorret Conway's chocolate cake didn't set in time, she was forced to remove the cake from the mold too soon, resulting in a disgusting, gloopy nightmare that oozed down her arms like something out of a horror film. 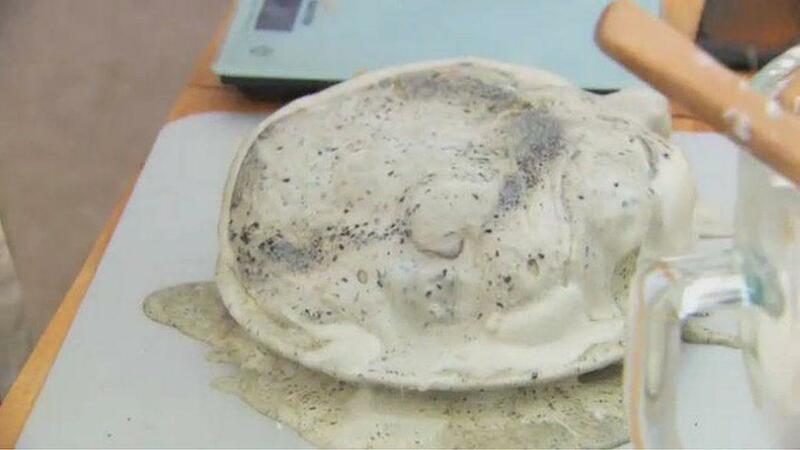 "It's just a cake," host Sue Perkins tried to reassure her. "It's not just a cake!" Dorret cried back. It didn't help when Paul said the cake was like "chewing on a rubber tire." Youch. Mat Riley was doing pretty well in the competition at first â€” until a fondant tennis court did him in. During a technical challenge where he had to make a fruitcake with a fondant tennis court on top, he mistakenly shoved the tennis net and rackets in the oven, causing them to melt. Paul remarked that the cake looked like it was "from Hades," and Mat was sent home. 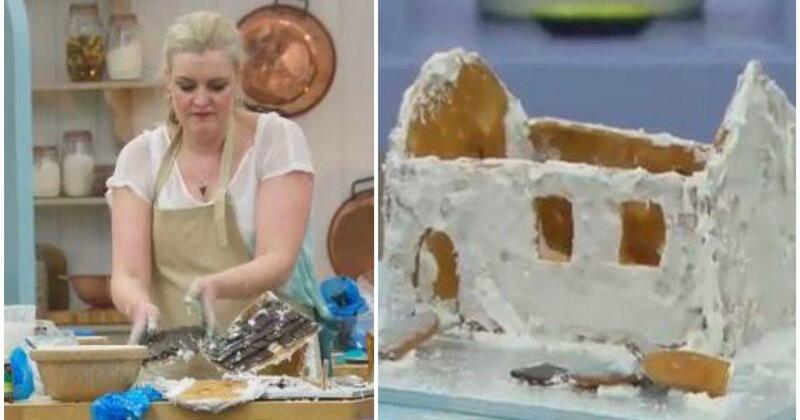 During a gingerbread showstopper challenge, poor Louise Williams struggled with a cake that literally started to fall apart in her hands. After making frustrated sighs and tears, she composed herself and managed to finish something that sort of looked like a house. Fortunately, the taste of her gingerbread was so good, she was kept around for another week. He might've been a fan-favorite during the most recent season of Bake Off, but Terry Hartill was a victim of his own ambitions. 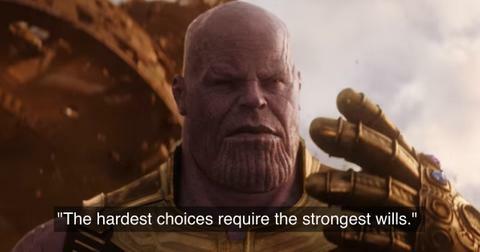 He always had really great ideas that he could never execute the way he wanted. The saddest example of this was his failed Eiffel Tower cake topper that he constructed entirely out of chocolate. It actually looked pretty amazing at first, but because it was so warm in the tent, the tower started to lean. When he tried to save it, the chocolate pieces crumbled in his hand. "I'm done," he said as he threw the top of the tower in the trash. Poor Terry. When Danny Bryden's creme pÃ¢tissiÃ¨re failed to set, it oozed out in an unappealing, sloppy mess. "Weâ€™re going to need a spoon with this, rather than a slice," Paul said. Apparently it tasted fine because she stuck around until the quarter final. 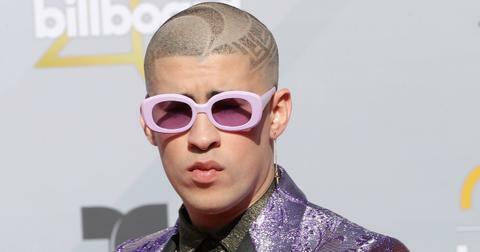 Ruby Tandoh was a controversial contestant on Bake Off, because fans thought Paul was being easy on her due to her looks. 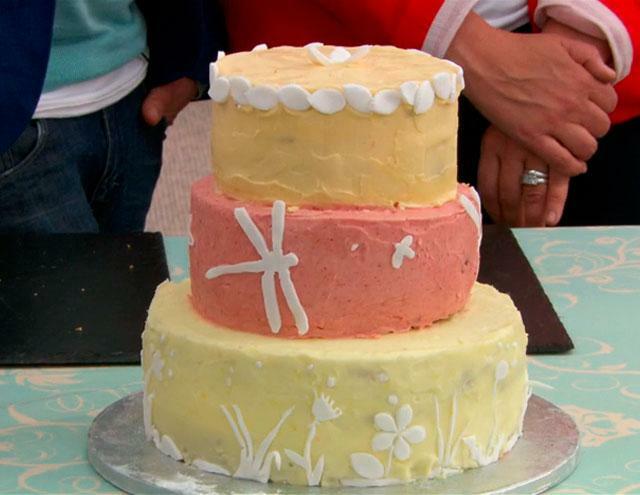 Whether you were a Ruby fan or not, there was no excuse for her finale showstopper cake, which was supposed to be an elaborate wedding cake but instead looked like something a child threw together. Needless to say, she didn't win. James' weird gingerbread barn was a complete disaster as it started collapsing on itself while he was making it. 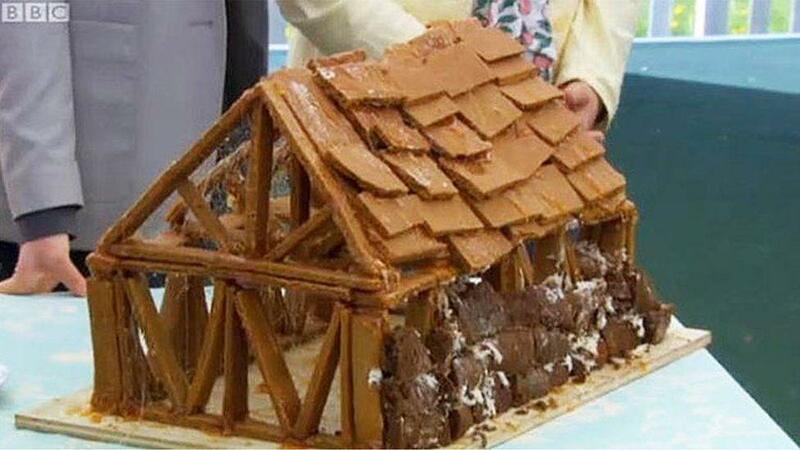 However, because he was clever, he threw some caramel "cobwebs" on the house and told the judges it was a "haunted" barn. Surprisingly, they bought it! 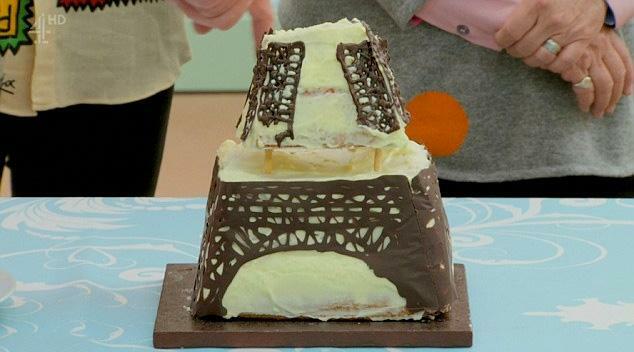 Honestly, there have been so many cake collapses on Bake Off, it's hard to narrow the list. 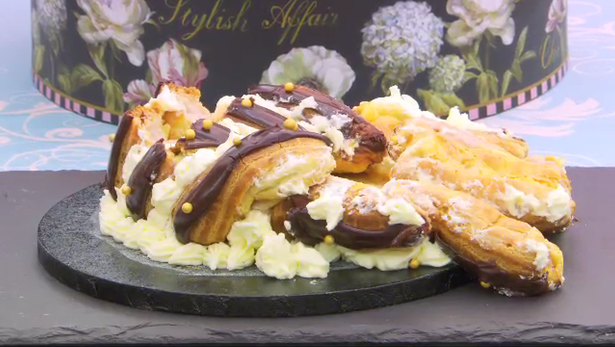 But Paul Jagger's Religieuse a l'ancienne, which was a stack of eclairs shaped to look like a nun, was so ambitious, it was sad to see it collapse into a pile of sad, sloppy goo. 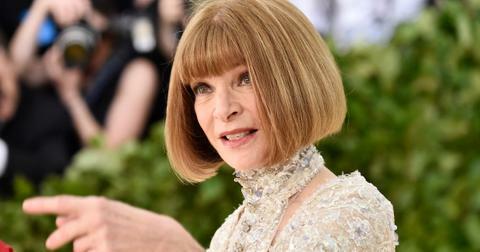 "My worst moment had to be the vol au vents â€“ it was a nightmare from start to finish," he said after he left the show. 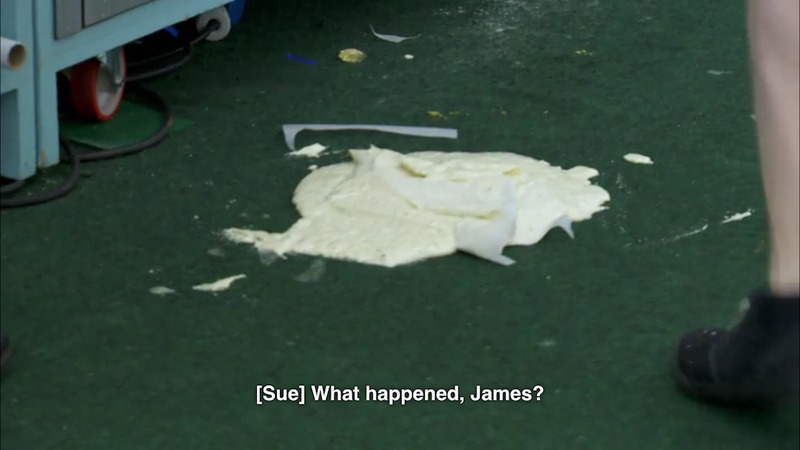 "There were flour and eggs everywhere." The horror! In a challenge where bakers had to make a biscuit that had their self-portraits painted on top, Dan Beasley-Harling's creation left everyone in stitches at the, ahem, implications. The picture was supposed to be of him holding a baby, but many of the other bakers remarked that the swaddled newborn looked more like a you-know-what. Paul was tame and said it looked like a "large prawn." After all, it's a family show! 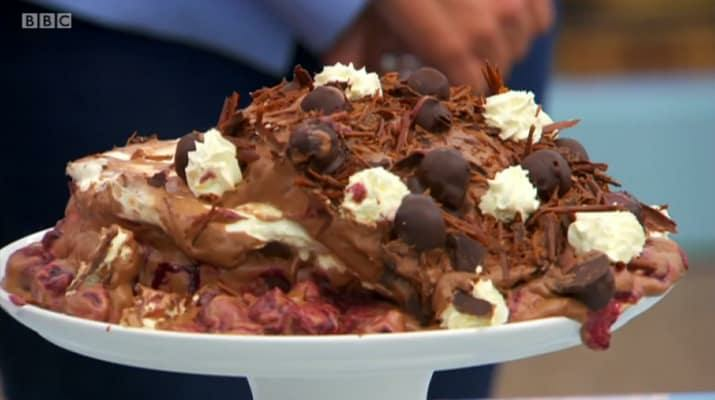 And of course, no disaster in Bake Off history could top #BinGate. 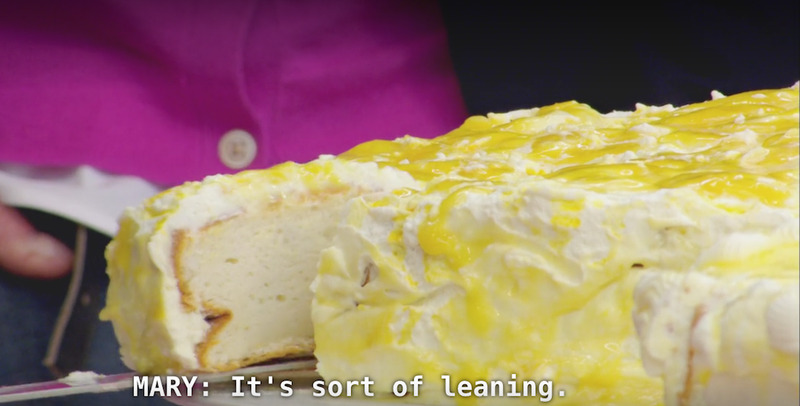 During series 5 (collection 1 on Netflix), contestants had to make ice cream cakes during one of the hottest days of the year. As everyone fought over freezer space for their cakes, Iain Watters placed his Baked Alaska in a fridge being shared with fellow baker Diana Beard. When Iain went to retrieve his cake from the fridge, he found that someone had removed his cake and placed it on the counter. Although it was only sitting there for 40 seconds, the entire cake had melted. Furious, he demanded to know who took his cake out of the freezer. Diana, rather unsympathetically, said, "Don't you have your own freezer?" Angry, frustrated, and now with a completely melted cake, Iain stomped over to the wastebasket and threw the whole cake away as he stormed out of the tent. Le gasp! The judges later scolded him for throwing his cake in the bin and he was sent home, but viewers felt he was sabotaged. The whole incident became a meme as everyone vilified Diana and threw their support behind Iain. 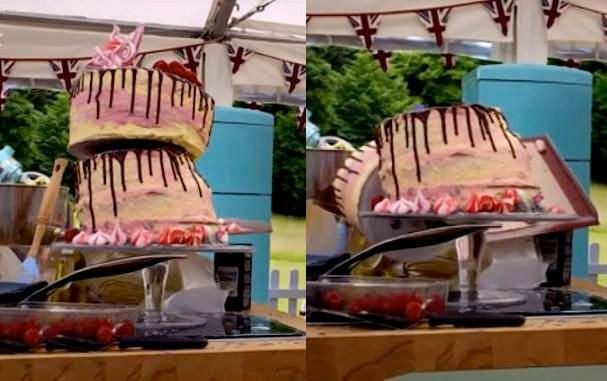 His melty trash can cake is now a permanent part of Bake Off history.